The first people to go from Cerrillos to Mexico City, at least after the end of the Native American turquoise trade peak of the 11th and 12th Centuries, were a group of European and African silver miners in 1591. The Camino Real or Royal Road linking Mexico City to northern New Mexico is generally been considered to have been developed from south to north. However, like the U.S. transcontinental railroad, it was started at both ends and met in the middle, two-thirds of the way from the south end in Mexico City and one-third of the way from the north end in Cerrillos. An expedition to colonize New Mexico was lead by Gaspar Castaño de Sosa in 1590-91. He was the lieutenant governor of the new Province of Nueva Leon in New Spain that made up much of northeastern Mexico at that time. As a provincial lieutenant governor he was a politically important man and felt he could start the colonization to the north in what is now New Mexico without authorization to do so. He was wrong. An old enemy of Castaño’s, Juan Morlete, offered to put together an expedition to go and arrest Castaño, and the government in Mexico City authorized him to do just that. Castaño ordered all the people in a small mining town, Almaden, to load their possession into ox carts and head north. They reached the Rio Grande River near modern Del Rio, and then up went the Pecos River to the southeast of the Galisteo Basin. They left the ten or more carts, women, children and most of the men plus most of their Native American allies on the Pecos River. After a reconnaissance of northern New Mexico they selected the Cerrillos Hills as the best site to establish a colonial town. It had taken them from June 1590 to February 1591 to find a wagon route to Cerrillos. They named the large Pueblo a league (3.4 miles) east of the Cerrillos mines San Marcos Pueblo and recorded the colonial camp’s location as San Marcos Pueblo, but they probably built their smelters and homes in the valley about a mile west of the Pueblo. A large spring at this location was used to water their livestock; it is now covered and today serves as the water supply for the town of Los Cerrillos. San Marcos Pueblo had been mining galena in the Cerrillos Hills for 300 years and some of their mines were over 50 feet deep. The Rio Grande Pueblos used the galena to glaze pottery and did not care if it contained silver or was just lead. The expedition apparently took samples from mines with only lead and after 17 days gave up on finding good silver ore and left Cerrillos. They had learned that the mountains by the modern town of Golden had good silver deposits. The first of them left Cerrillos (San Marcos) Spring on March 7, 1591. In less than two miles on their journey south they crossed what 425 years later is the road connecting the Cerrillos Hills State Park Headquarters and the park trailhead parking lot. Though not generally recognized, Cerrillos should be considered the birthplace of the northern third of the Camino Real. Cerrillos (San Marcos) Spring is two miles to the north of modern Cerrillos and was the northernmost point reached by the carts of the Castaño de Sosa Expedition in 1591. 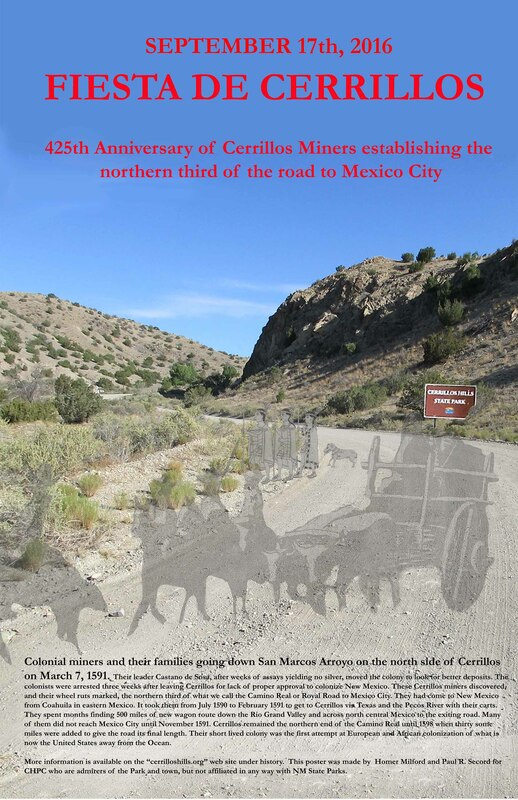 If a road is defined as a route used by wheeled vehicles, as opposed to a trail which is used by livestock or people on foot or horseback, then Cerrillos was as far north as the road from Mexico City went from 1591 until the Oñate Expedition of 1598. From Cerrillos the de Sosa carts went down the Galisteo Valley southwest to Santo Domingo Pueblo. After the Arrest of the Castaño de Sosa colonists at Santo Domingo Pueblo on March 29, 1591 records are minimal. No journal was kept and the only documentation is a few letters. On their journey back it took them months to find a direct wagon route to the northern mining camps in Mexico. They found a short cut past a bend in the Rio Grande River called the Jornada del Mureto. Morlete, on orders to take de Sosa to Mexico, disbanded most of his 40 men in northern Mexico, and his expedition became divided into two groups, the first group reaching Mexico City in November and the last of his men not arriving until January 1592. By the time the Kings Court in Spain approved Castaño’s colonization of New Mexico he had been killed by pirates while in exile in the Philippines. Juan de Oñate was approved to do the colonization of New Mexico. The Oñate Expedition came back up the de Sosa road tracks to Cerrillos seven years later. He hired Juan Rodriguez from the de Sosa expedition to lead his colonists up the wagon ruts. The only place there is a record of Rodriquez having trouble is the sand dunes south of modern Juarez, Mexico. By the time the main body of the Oñate Expedition reached the dunes the route through them had been found as well as a route around them. The soldiers went through the dunes to the river in two days and recorded the distance as 6 leagues (20 miles). The route around would have been longer, but probably quicker. Both routes were used until modern times. The old wagon ruts were easy to follow up the Rio GrandeValley and Oñate left the expedition on a reconnaissance into northern New Mexico. He examined the Cerrillos mines and then met his the colonists at Santo Domingo Pueblo. More then likely it was Rodriguez who led the colonists from Cerrillos Springs to the Santa Fe River and on north to near Espanola. He had been to both these places in 1591. The only difference between the Oñate Expedition route and the return route of de Sosa was to make an alternative road around the sand dunes near Juarez, Mexico and extending the road forty miles from Cerrillos to San Juan Pueblo.